Mary Ball Washington, born Mary Ball (November 30, 1708 – August 25, 1789), was the second wife of Augustine Washington, a planter in Virginia, and the mother of George Washington, the first President of the United States, and five other children. Mary Ball Washington House, 1200 Charles Street, Fredericksburg, by Frances Benjamin Johnston, 1927. The house was originally built in 1761 and has later additions. Mary Ball was born in 1708 in Lively, Virginia in Lancaster County. She was the only child of Col Joseph Ball (1649-1711) and his second wife, Mary Johnson Ball. Joseph was born in England and emigrated to Virginia as a child. Fatherless at three and orphaned at twelve, Mary Ball was placed under the guardianship of George Eskridge, a lawyer, in accordance with the terms of her mother's will, for whom her son George Washington, was named, consistent with the naming conventions at the time. Her paternal grandfather was William Ball (1615-c.1680); he left England for Virginia in the 1650s. His wife Hannah Atherold arrived later along with their four children, including Mary’s father Joseph. Mildred Washington (1739–1740), who died young. Augustine died in 1743 when son George was 11 years old. On his deathbed, "Gus" gave his son George three books on prayer. In some of those books, now in the Lyceum in Boston, Mary Ball Washington, also wrote her name. Unlike most widows in Virginia at the time, Mary Ball Washington never remarried. When George was 14, his older half-brother Lawrence Washington, who commanded a unit of Virginia Militia that served on board with British Admiral Edward Vernon, for whom Mount Vernon was named, arranged for young George to become a British Navy Midshipman. However, Mary's highly respected half-brother, Joseph Ball, under whom the Virginia House of Burgesses had voted money to pay the cost for Virginia's young men to go study for the ministry, wrote a reply to her letter requesting advice, wherein he said do not allow your son George to join the British Navy, for they will "...treat him worse than a slave or a dog." Mary managed the family estate and 276 acres of Ferry Farm (a plantation) with the help of others until her eldest son came of age and well beyond. She lived to see that her son, George Washington, commanded the Continental Army to independence and be inaugurated as the first President of the United States in 1789. After learning that he had been elected President in April 1789, George Washington traveled from Mount Vernon to visit his mother in Fredericksburg. He was accompanied by Martha Washington's grandson George Washington Parke Custis. George Washington knew his Mother was ill. She was suffering from breast cancer, the disease to which she eventually succumbed, but, he sought her blessing as he embarked on another service to his Country: the new concept of "The Presidency of the United States." Here, as popularly told, the stories and lore -- probably begun and perpetuated by Custis -- take over. It is said that Mrs. Washington informed her son of her poor health and expected to die soon. Further, the story continues, that her son, George, said that he would need to decline to serve as President. George's mother Mary responded, saying "But go, George, fulfill the high destinies which Heaven appears to have intended for you for; go, my son, and may that Heaven’s and a mother’s blessing be with you always." This purely legendary account is frequently cited as true, but cannot be verified. What can be documented is that he received her approval and, of course, left Fredericksburg and made his way to New York City where he was inaugurated at the end of April. After a lengthy illness, on August 25, 1789, Mary Ball Washington died of breast cancer at her home in Fredericksburg, Virginia. While there is a legend that Mrs. Washington was said to be openly opposed to her son's revolutionary politics and, according to French officers based in Virginia during the war, she was a Loyalist sympathizer, there is no credible source to support that legend. The facts are that other than her son George who was Commander in Chief of the Continental forces (Army and Navy), Mary's other three sons Samuel, John Augustine, and Charles, all served in the Virginia Militia. Her son-in-law Fielding Lewis (husband to her daughter Betty), was in charge of the Fredericksburg Gunnery or Gun Manufactory. The gunnery works made muskets for use by American Revolutionary forces, and ended up almost bankrupting Lewis in the process. Some interpretations of Mary Washington label her "difficult", at best. But, she went against the social conventions of the times by not re-marrying and taking on farm management responsibilities. Of course, had she re-married, she faced the possibility that her children (George and the others) would not be entitled to the rights of the property (real and personal) that she had. Stubborn, perhaps, but, other interpretations might say she was selflessly looking out for her family. Mary Washington was by no means poor despite the fact that she petitioned the Government of Virginia claiming, in response to a Virginia government notice to citizens to do so, asking to be reimbursed for farm animals, horses and cattle that she gave to support the American war effort. Her son, George, purchased her a fine house in Fredericksburg, four blocks from some "Prayer Rocks" Mary frequented to pray for her children and only two blocks from Kenmore, where George's sister Betty (Mrs. Fielding Lewis) lived. Mary lived in her home nearby from 1772 until her death in 1789, but George also arranged for water from the "medicine springs" on the Ferry Farm property, her home for many years, to be brought to his mother in town each day. In her will, Mary Washington left George the majority of her lands and appointed him as her executor. Mary Washington frequently visited her daughter Elizabeth "Betty" and her husband Fielding Lewis at their Kenmore Plantation two blocks from her home in Fredericksburg. She had a favorite "prayer rock" that was close to the Lewis mansion. Tradition has it that this was her favorite retreat for reading and prayer. She asked Betty to bury her there after her death, and her daughter arranged that. Her third son, John Augustine Washington, was the father of Bushrod Washington, who was nominated by President John Adams to the U.S. Supreme Court, and confirmed by the Senate in 1798, while his Uncle George was living in retirement at Mount Vernon. Charles Town, West Virginia, is named for her fourth son, Charles Washington. The national capital and many other cities, towns and villages are named "Washington" for her first son, George Washington. The Ancestry of George Washington can also be found on the Mount Vernon website. 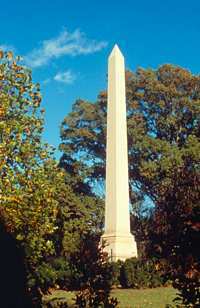 Several monuments have been erected to Mary Ball Washington in Fredericksburg, Virginia, where she lived from 1772 until her death in 1789. The Mary Washington House in Fredericksburg has been preserved by Preservation Virginia (formerly known as the Association for the Preservation of Virginia Antiquities) who, in mid-2012, signed an agreement passing ownership to the "Washington Heritage Museums." The residence is open to the public and operated as a historic house museum. It contains a fine collection of antique furnishings, some with Washington family provenance. Mary Ball Washington is buried on the grounds of Kenmore, the former home of her daughter and son-in-law Fielding and Betty Lewis. Kenmore is operated as a house museum and is open regularly for public tours. The University of Mary Washington, a public university in Fredericksburg, Virginia, was named for her. The Mary Washington Hospital, located in Fredericksburg, is named for her. The SS Mary Ball was a World War II Liberty ship. ^ "Ball Family". George Washington's Mount Vernon. Mount Vernon Ladies' Association. Retrieved November 1, 2017. ^ Gizzard, Frank E. (2002). George Washington: A Biographical Companion. ABC-CLIO. p. 335. ^ See the appendix of the book Albion's Seed by David Hackett Fischer for an insightful discussion of four naming conventions in use at the time in Great Britain. ^ Custis, George Washington Parke; Lee, Mary Randolph Custis; Lossing, Benson John (1860). Recollections and private memoirs of Washington. Derby & Jackson. p. 147. ^ Schneider, Gregory S. (May 12, 2017). "The mother who made George Washington — and made him miserable". The Washington Post. Retrieved January 4, 2018. ^ Thompson, Mary V. (November 9, 2017). "Mary Ball Washington's Battle with Breast Cancer". George Washington's Mount Vernon. Mount Vernon Ladies' Association. Retrieved January 4, 2018. ^ Soja, Taylor. "Mary Ball Washington". George Washington's Mount Vernon. Mount Vernon Ladies' Association. Retrieved January 4, 2018. ^ Hoppe, Geoff. "Fielding Lewis (1725–1781 or 1782)". Encyclopedia Virginia. Library of Virginia, Virginia Foundation for the Humanities. Retrieved January 4, 2018. ^ Hamilton, Michelle L. (2017-11-06). Mary Ball Washington - Mother of George Washington. Michelle L. Hamilton. ISBN 9780999568811. Wikisource has the text of a 1920 Encyclopedia Americana article about Mary Ball Washington. The Life and Legacy of the "Grandmother of our Country"
This page was last edited on 9 April 2019, at 15:12 (UTC).